On May 20th the Money Green/Frenz For Real team, with the assistance of Vital Video Production, shot a medley video for the RAID RIDDIM. Raid riddim, which was released on Tuesday April 19th, has been getting mixed reviews from various music critiques. 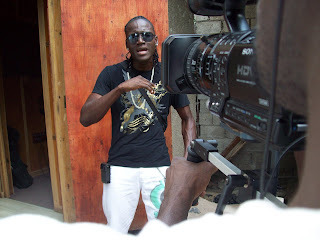 Some have said that the rhythm does not have the necessary substance to cause a stir, while others have declared it a top dancehall rhythm for 2011. Whatever the view, Omar Benjamin (of Frenz For Real) and Damion Jordine (of Money Green Music) felt it was worth investing in a video and so they did. Though the actual compilation has nineteen tracks, the video only features songs by Karamanti, Propally, Rahjah Dalla, Bentley, M.A.P, Gott-Yo and D2di-A. The selections chosen for the video was done based on the momentum the songs have been getting as it relates to radio and in the streets rotation. The RAID RIDDIM video medley have already been released to some TV stations in Jamaica but should be officially released to all networks within the next week. Persons operating BLOGS and music websites that would like the video to be featured on their site, should email mariajackson27@yahoo.ca to have a copy sent to them.